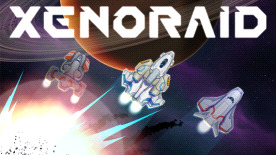 Xenoraid is an exciting vertically scrolling shoot'em up rooted in the classic action gameplay of the genre with modern additional features. Intercept the alien threat in missions that play out differently every time. Pilot skillfully to line up devastating bursts of fire. Switch between four fighters during combat to bring in the best weapons for each situation. Upgrade, repair and enhance your squadron between missions. Bring down huge alien capital ships in hectic bossfights. Put your skills to the ultimate test in three endless survival missions with online leaderboards!